Author(s) Gurak, Laura, J.; Lannon, John, M.
For introductory courses in Technical Communication. 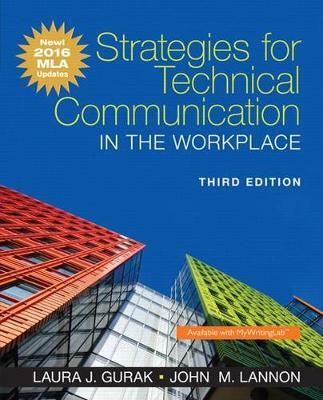 Based on the acclaimed Technical Communication by Lannon and Gurak, Strategies for Technical Communication in the Workplace prepares students for workplace writing through a clear and concise writing style, useful checklists, practical applications, numerous sample documents, and coverage of technology and global issues. The 3rd Edition addresses changing technology in the workplace with a complete chapter on social media, updated examples, and sample documents. This brief and affordable text is accessible to students of all writing levels.